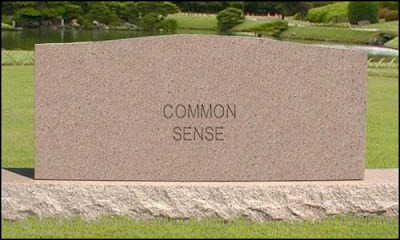 Today we mourn the passing of a beloved old friend, Common Sense, who has been with us for many years. No one knows for sure how old he was, since his birth records were long ago lost in bureaucratic red tape.. He will be remembered as having cultivated such valuable lessons as: Knowing when to come in out of the rain; Why the early bird gets the worm; Life isn't always fair; and maybe it was my fault.. ..........I mow his grass for him once a month. I also take flowers along for his cousins... Faith, Hope and Charity who are buried in the plots alongside. UNCOMMON SENSELESS is alive and well! And for the life of me I don't understand why schools and parents want unruly student with bad breath running amok! Excellent post Sir Hook. Along these same lines I recommend the book "Idiot America, How Stupidity Became a Virtue in the Land of the Free" by Charles P. Pierce. It is hilarious until you realize it is true.